Golden Delicious has a very poor reputation in the UK, a legacy of the time when large quantities of bland under-ripe bright green French-grown Golden Delicious apples dominated supermarket shelves. However, Golden Delicious is a very different proposition when home-grown in good conditions - a handsomely-shaped apple with a golden-green skin, crisp juicy flesh, and a rich sweet flavour, reminscent of raw cane sugar. If you like crisp sweet apples then it is hard to beat a home-grown Golden Delicious, picked late in the autumn when it is properly ripe. Home-grown Golden Delicious apples still retain the advantages of commercially grown examples - they are versatile for eating fresh or using in the kitchen, and of course they are one of the best apples for long-term storage, retaining flavour and crispness for several months in a cold shed or in the fridge. Please fill in the details below and we will let you know when Golden Delicious apple trees are back in stock. Golden Delicious produces unusually large amounts of pollen.? Cedar apple rust: Very susceptible? Golden Delicious is in flowering group 4. Golden Delicious is partially self-fertile, but fruiting will be improved if there is a compatible tree of a different variety nearby. Golden Delicious is easy to grow, and very productive. In the UK it does best in the south and east as it prefers a drier climate, and a warm autumn helps. It is usually a good pollinator for other apple varieties, particularly traditional English varieties such as Cox, because it flowers over a long period, producing a lot of pollen, and is is not closely related to them. Golden Delicious is not a French apple, as many people assume - it was discovered in West Virginia, USA, in the 1890s. 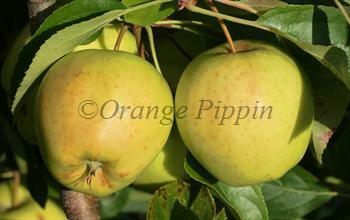 Golden Delicious is almost certainly a seedling of an old American variety called Grimes Golden. The original tree survived until the 1950s, by which time Golden Delicious was firmly established as one of the most widely-planted of all apples.